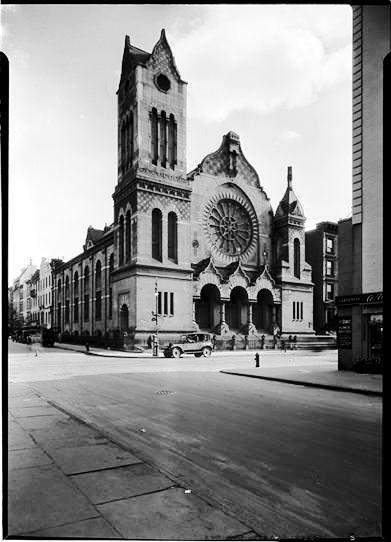 In the 1820s the Jewish population in New York City was still relatively small; yet it was substantial enough to have three separation congregations: Congregation Shearith Israel, the oldest; Congregation B’nai Jeshurun; and Congregation Anshe Chesed. Composed of German, Polish and Dutch Jews, Anshe Chesed was the youngest group, established in 1828. Congregation Anshe Chesed (People of Kindness) was made up mostly of immigrants with little money or status. They worshiped in rented rooms until 1842 when the old Quaker Meeting House at No. 38 Henry Street was purchased and converted to a synagogue. Within a decade the congregation grew to be the largest in America. Anshe Chesed distinguished itself from other Manhattan congregations as well by embracing the Reform Movement. But this change would not become fully rooted until the group built a new, impressive synagogue on Norfolk Street in 1848. Here more reforms were put into place—the introduction of a choir of both sexes, a pipe organ, and the allowing of families to sit together during worship, for instance. Prolific architects D. & J. Jardine received the commission. The brothers, David and James, would be active throughout the rest of the century, designing commercial structures, rowhouses and mansions. The cornerstone was laid on July 3, 1872 with ceremonies that included “the singing of a chorale by a male and female choir, accompanied by a brass band.” In the box within the cornerstone were placed a history of the congregation, several newspapers, a list of officials of the Federal Government, State, County, and City, a list of the other Jewish congregations in New York City, and a number of ancient and modern coins, including a Danish token with Hebrew writing, among other items. Consecrated on September 12, 1873, the $200,000 structure reflected the wealth and position of its congregation. 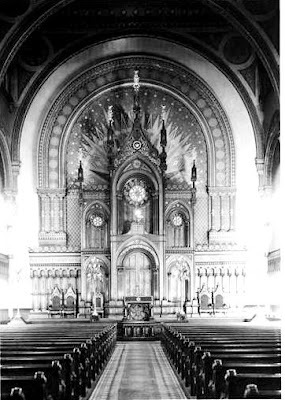 A mixture of Romanesque and Victorian Gothic, it was 83 feet wide and stretched 120 feet along 63rd Street. Brick, stone and terra cotta joined forces to create a colorful, eclectic façade. A massive corner tower rose 135 feet above the sidewalk, vying for attention with the gigantic stained glass rose window. 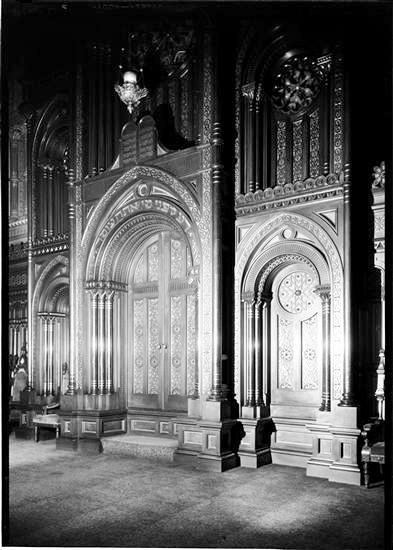 A Moorish-inspired portico, supported by two spindly stone columns greeted the congregation. Capable of accommodating 1,400 worshipers, the interior was awe-inspiring. Brilliantly-colored stenciling, inlaid woodwork, brass lighting fixtures and ornate carving bordered on overwhelming. It would not be long before a near-schism erupted between the two groups. Prior to 1840 Anshe Chesed purchased a plot 25 by 100 feet on Sixth Avenue between 45th and 46th Street which it used as a burying ground. When the City outlawed burials south of 83rd Street in 1851, the congregation established another graveyard on 89th Street near Madison Avenue. That, too, was closed by the City for the same reasons—health fears and property needs. Having learned its lesson, the congregation purchased a tract of land at Union Fields, Long Island to be used as a cemetery. It was now being used by the newly-combined congregations. When some members realized that the real estate of the old burial grounds in Manhattan was now worth between $70,000 and $80,000, they proposed to move the bodies to Long Island and sell the land. A permit for the removal of the bodies was obtained from the Board of Health and a notice went out to the congregants. The reaction was swift and angry from some. Eventually the controversy was put to rest when the defiant congregants lost their battle and the coffins were moved. Two things occurred in 1886 that deeply offended the rabbi. The first was the Board of Trustees independently deciding to look for an assistant rabbi who spoke fluent English. Rabbi Kohler was incensed when he learned of their action without involving him. The trustees wanted an English-speaking rabbi to perform services on Sundays, rather than the Sabbath, because many of the young members held jobs that required them to work Saturdays. Then, as Kohler prepared for a convention of reform ministers in Cincinnati on June 16, the Trustees requested a report on what he intended to do there. Rabbi Kohler did not feel he was required to submit his plans nor to answer to the Board. Around June 1 he sent a letter to the Board of Trustees “in which he announced his intention of resigning unless the Trustees accede to certain demands,” reported a newspaper. Kohler expected his threat to be met with acquiescence. He was no doubt surprised when one of the leading members of the congregation, Gerson N. Herrman, issued an announcement that intimated the resignation might be accepted. On June 6 the meeting was held, its members being unanimous about looking for an English-speaking assistant and in denouncing the rabbi’s rash reaction. Nevertheless, a committee of nine was appointed to meet with Kohler. Kohler’s insistence on looking forward, rather than back, was evidenced in the titles of his sermons. The same year that he honored Henry Beecher, he preached on “Prejudice,” “Prohibition and Self Control,” “Evolution and Morality,” and “Jew and Gentile: What is Going On?” among similar issues. 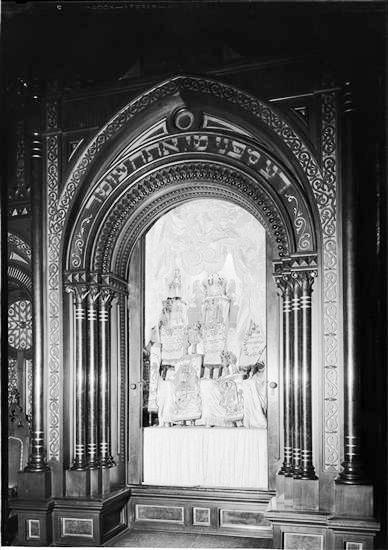 Dedication ceremonies were held on the evening of September 4, 1891 after the temple had been “refitted and renovated,” according to The New York Times. The Congregation Rodeph Sholom involved itself in political and social issues, as well as religious matters. When the first meeting of the Israelite Alliance of America was held in the Lexington Avenue building on May 25, 1902, the problem of Russia’s discrimination against American Jews was addressed. The temple was equally filled on April 20, 1912, following the sinking of the RMS Titanic. Rev. Dr. Rudolph Grossman addressed those who asked why God allowed such a tragedy. “Is God at fault that there were not sufficient lifeboats? It is human stupidity, sinfulness, and cupidity,” he said. He spoke also of Isidore Straus, philanthropist, civic leader, and co-owner of Macy’s department store, and his wife, Ida. “While we mourn for the humblest, the stokers and the sailors who died like men in the performance of their duty, and for the humblest in the steerage, we also mourn for those great men in philanthropy and in other lines which this country could ill afford to lose. By 1926 the Lexington Avenue corner had greatly changed. Apartment buildings and retail stores had replaced the homes along the avenue. 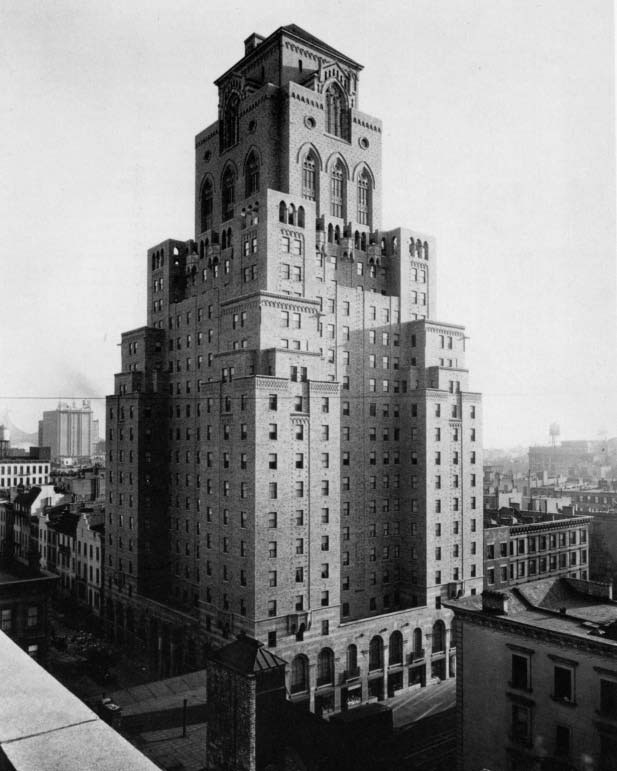 On January 31 that year The New York Times announced that the Temple Rodeph Sholom, “a landmark of the district,” had been purchased “as a site for an apartment hotel” for about $800,000. The congregation purchased land on 83rd Street, near Central Park West, and laid plans for a new $2 million temple there. 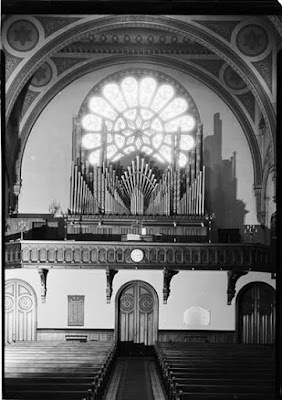 The final service was held on Monday evening, October 4, 1926. In its place the monumental Barbizon Hotel for Women rose, completed in 1927. The masterful structure, designed by Palmer H. Ogden, survives today. The brick-faced Italianate houses that lined the south side of West 23rd Street between Eighth and Ninth Avenues at the time of the Civil War were not mansions. Yet the 25-foot wide homes were far from middle-class. The speculative row was designed with the financially-secure professional class in mind. The house at No. 338 was home to the John S. Boyd family. Like its neighbors, it was three stories tall above a high basement. A broad brownstone stoop rose to the parlor floor where, most likely, floor-to-ceiling windows opened onto a cast iron balcony, like its neighbor at No. 336. Boyd’s house went one step further than its neighbors in the treatment of the upper floor openings. Rather than the brownstone lintels and sills, No. 338 featured carved limestone enframements. Boyd was a director in several insurance firms, including the Clinton Fire Insurance Company and the First National Eclectic Life Assurance Society of the United States. 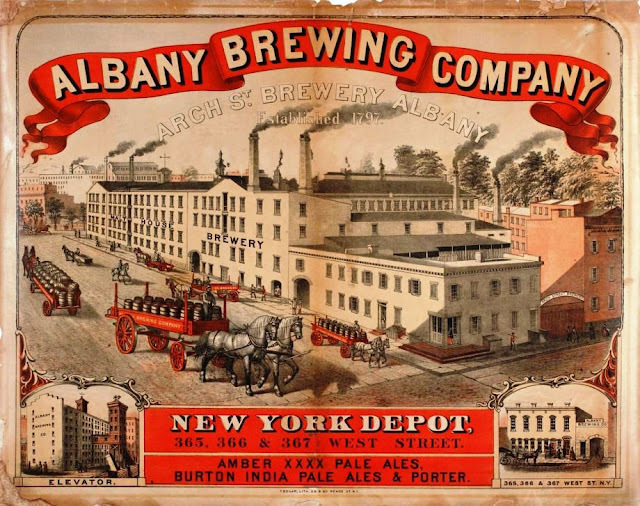 But most importantly he was President of the Albany Brewing Company, which was founded by his grandfather in Albany decades earlier. Boyd’s extensive brewery was in Albany; but not extremely far away from the 23rd Street house, on West Street and West Houston Street, was the firm’s New York office and “depot.” From here shipments of beer were loaded onto train cars or boats on the North River (later renamed the Hudson River). The scope of Boyd’s business was evidenced in 1878 when he filed an application to lay railroad tracks between Morton and Leroy Streets to the river. The house would see the comings and goings of various tenants over the next few decades. Civil engineer George Mitchell Estabrooke lived here at least from 1904 through 1908. And by 1913 a “Miss Flynn” was here. A caring aunt, her 7-year old nephew Donald Daly suffered from tuberculosis in the knee. The day after Freidmann’s office opened, at least 1,000 afflicted persons lined up along Fifth Avenue seeking treatment. The publicity had attracted the notice of Miss Flynn. Little Donald was admitted to Mount Sinai Hospital where Dr. Friedmann started treatments. In the meantime, the doctor accepted $125,000 “part payment” from Moritz Eisner for the American rights to the remedy. The U.S. Government’s doctors were more skeptical. The National Association for the Study and Prevention of Tuberculosis commenced a study; and in May 1913 Washington DC Doctor Anderson published an official report that dismissed Friedmann’s “cure” as ineffective. Also in the house at the time was Susan Campbell. On St. Patrick’s Day 1914 she married Harry C. Swift who managed the B. F. Keith’s Harlem Opera House. The boarding house that Susan Campbell and Miss Flynn enjoyed would soon see significant change. No. 338 was owned by James D. Powell. He lived on Livingston Place (later renamed Nathan D. Perlman Place) with his wife and son. His death on August 17, 1916 would change the course of the 23rd Street house. On February 18, 1919 it was sold at public auction “to close the estate.” It was purchased by the Lawyers Title & Trust Co., which quickly resold it to the New York Savings Bank that same year. Originally incorporated as the Rose Hill Savings Bank in 1854, the institution was well-known in the Chelsea area; its main bank building being an imposing Greek temple-like structure on the northwest corner of 14th Street and Eighth Avenue. In 1921 the bank began the process of renovating the old high-stoop house to a modern bank. The basement and first floor were transformed into a single, soaring space accessed through bronze doors within a two-story arched opening. At the right side a doorway provided access to the apartments upstairs. It was echoed in the window on the opposite side and both mimicked the treatment of the upper floor openings. While the residential character of the third and fourth floors—including the bracketed cornice—remained intact; the new stone front presented the clean, modern visage of a stable financial institution. The upper floors were leased to residential tenants, including attorney Earl A. Smith of the law firm McElligott & Smith. In 1922 he took the bench as a temporary magistrate, filling the place of Judge Matthew T. Breen who was ill. When the bank was taken over by the Century Bank in 1928, it signaled a series of rapid-fire changes. 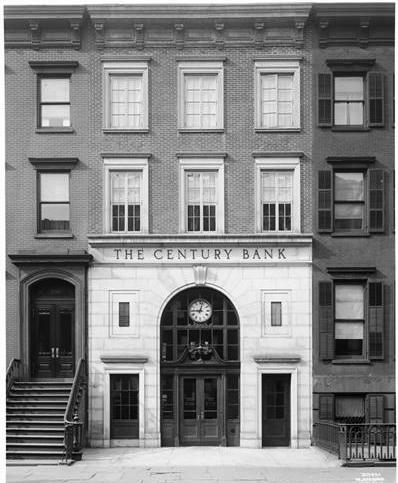 Later that year Century Bank merged with the Dewey State Bank, while retaining its old name. By 1930 it was a branch of the Interstate Trust Company while, again, still maintaining the Century Bank name. Reacting in a way that no doubt made his mother proud, Harry ran to Patrolman Michael Kent who was on duty nearby. Kent notified bank officials who rushed to the scene. One would surmise that someone had significant explaining to do the following morning. The house that was once home to a successful beer brewer is little changed since its 1921 transformation to a bank; at a time when this section of Chelsea was rapidly changing. By the first decade of the 20th century, actor Henry Miller was not only a leading man, but a successful theatrical manager. Miller could not have overlooked the trend of stage stars like Maxine Elliot, John Wallack and Edward Harrigan erecting and operating their own theaters. 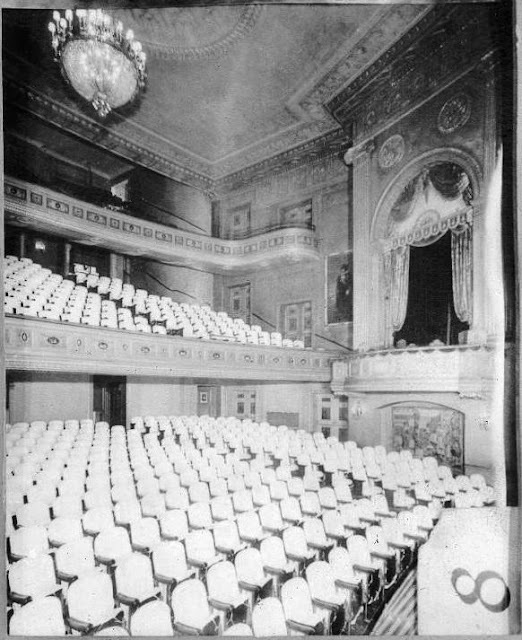 Backed by the wealthy socialite and philanthropist Elizabeth Milbank Anderson, Miller laid plans for a Times Square theater around 1913 when the old brownstone home of Sarah M. Moore at No. 124 West 43rd Street, between Broadway and Sixth Avenue, became available. It was an unexpected move for Anderson—she was more well-known for her activism and financial support of public health, women’s education, and African-American education. Felix Isman first purchased the Moore house, adding to his 43rd Street holdings that now stretched from No. 124 through 130. His intention was to erect “a large theatrical enterprise, which later, however, failed to develop,” explained the Real Estate Record & Builders’ Guide in 1916. Miller assembled what was a team, of sorts, of architects. 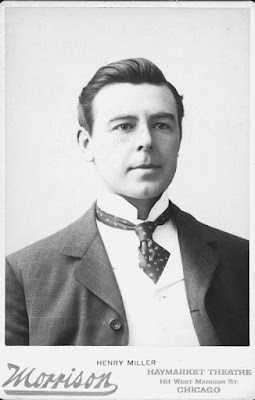 On January 6, 1918 The Sun reported “The architects are Paul R. Allen, in association with Henry Creighton Ingalls and F. Burrall Hoffman, who, jointly or individually, were responsible for the Century, Winthrop Ames’s Little Theatre and the Globe Theatre.” Almost equally important in the designing process was Miller, himself. “Many of Mr. Miller’s ideas as to what a theatre ought to be, gained in his years of experience in his profession, are embodied in the theatre,” said The Sun. The architects turned to the recently popular neo-Georgian style of architecture. The stately red brick façade trimmed in white stone recalled Colonial architecture with its elegant many-paned arched openings, shallow pilasters with ornate capitals, and massive classical stone urns set deeply within story-tall niches. Elizabeth Milbank Anderson died in 1921 leaving an estate of about $7 million, most of which was left to charity. The land under the Henry Miller’s Theatre was sold by the estate in March 1922 for about $570,000. The change in property ownership was not noticed by theater-goers; for now it simply meant that Henry Miller’s rent checks were payable to a different landlord. Miller starred in most of the plays produced here, and managed to book some of the most recognized names in the American theater. The matinee performance of Romeo and Juliet on April 19, 1923 marked Jane Cowl’s 100th performance as Juliet. The actress was presented with a reproduction of the 1623 edition of Shakespeare’s play in the possession of the Duke of Devonshire. She donated all the proceeds of the following Monday’s performance to establish a memorial to Sarah Bernhardt. Shortly after arriving, the actor became ill and his doctor, Edward Cussler, was called. 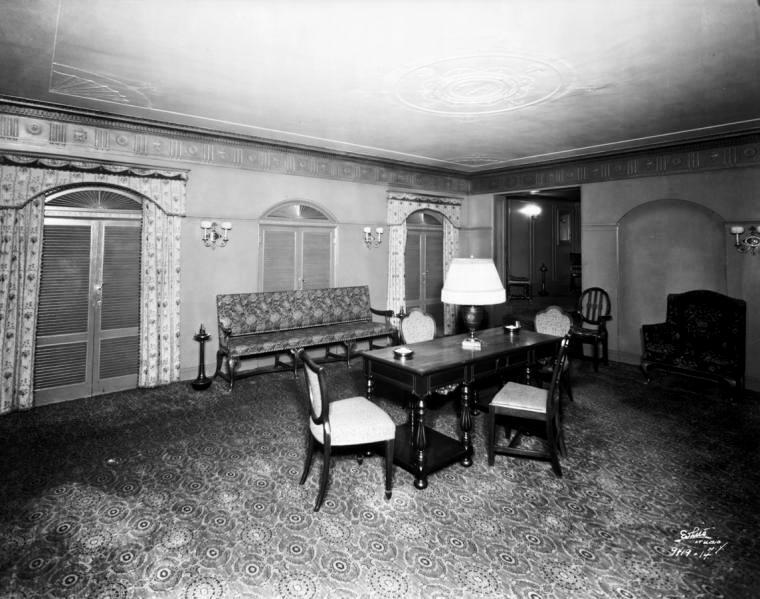 Miller was taken to this apartment at No. 101 West 57th Street and opening night went on without him. The following morning he was taken to New York Hospital, where he was diagnosed with pneumonia in the right lung. At around 11:15 on the night of April 9 he died. Miller’s funeral was originally schedule to take place in the Church of the Transfiguration, known as “The Little Church Around the Corner,” or “The Actor’s Church,” on Monday April 12. The services were moved to Tuesday; a change that one mourner missed. Joseph Hahn, the blind pencil vendor, sat for an hour in the church until someone realized the situation and informed him of the postponement of the funeral. After nearly two decades, Hahn still operated his little stand in front of the theater. Ironically, when the hundreds of prominent men and women from the theatrical profession filed into the church the following morning, a policeman barred Joseph Hahn. The poor blind man's threadbare clothing stood out among the well-dressed crowd. But, as Henry Miller had done so many times, a friend came to Hahn’s rescue and escorted him into the church. Among the celebrity mourners were George M. Cohan, Channing Pollock, Amelia Bingham, Ina Claire, Otis Skinner, David Belasco, John Drew and A. L. Erlanger. 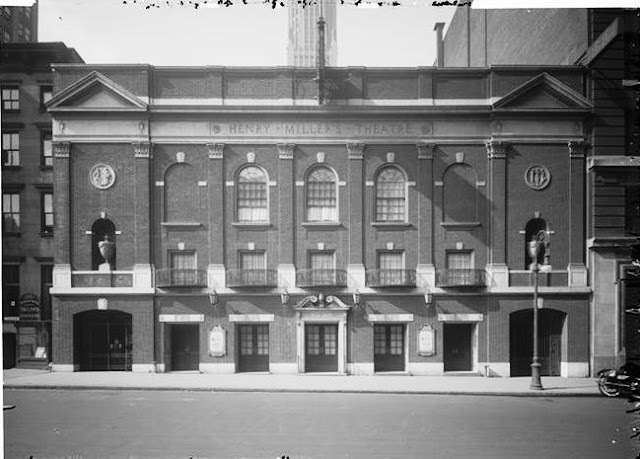 While many Broadway theaters suffered heavily during the Great Depression, Henry Miller’s Theatre kept on with respected plays and headlining actors. Among those who played here were Leslie Howard, Lillian Gish, Douglas Fairbanks, and Ruth Chatterton. Nevertheless, on June 20, 1931 management announced that “the best seats” had been reduced from $3.85 to $3. In the early 1960s the theater was still presenting big names. On May 13, 1964 Josephine Baker opened her 24-run show. The day after that performance ended, Helen Hayes, now 64 years old, returned to the Henry Miller in The White House, co-starring James Daly. Later that year Arnold Scaasi opened in P.S. I Love You; and in November it was announced that Auntie Mame would open on February 10, 1965. 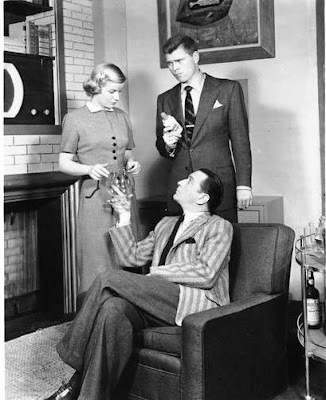 Two days after the opening of Auntie Mame, 80-year old Gilbert Miller confirmed reports that the Henry Miller’s Theatre was for sale. On April 20, 1966 The New York Times reported that it had been sold to H. William Fitelson, a lawyer, for $625,000. Legitimate theater soon gave way to art movies. But the deteriorating condition of West 43rd Street took its toll. By the 1970s the former Henry Miller’s Theatre (it was renamed a few times, including the Park-Miller and the Avon-at-the-Hudson Theater), had become a seedy pornographic movie venue. Howard Stein closed down the movie theater in 1977, gutted the auditorium in a $2 million conversion, and reopened it in June 1978 as Xenon, a disco that rivaled Studio 54. When that club closed, it was resurrected as Shout in the late 1980s, and Club Expo in the ‘90s. It appeared that the beleaguered theater was breathing new life when a stage revival of Cabaret opened in 1998 following the closure of Club Expo. A remodeling of the interior reflected the war-time Germany sets. The theater was renamed the Kit Kat Klub, echoing the Cabaret theme. The last play produced in Henry Miller’s 1918 auditorium was Urinetown, which opened in 2001. 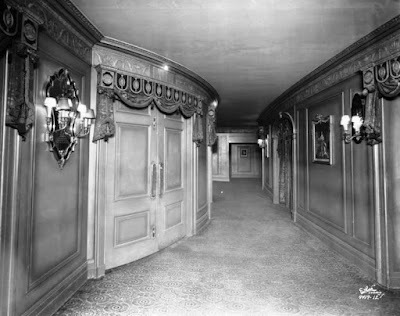 The theater was closed and demolished 2004 for construction of the 55-story Bank of America Tower facing Bryant Park. The façade was preserved as the face of a new 1,055 seat theater within the new building. It was named the Stephen Sondheim Theater in 2010 on the composer-lyricist’s 80th birthday. While facadism—the practice of preserving only the façade of a historic building while demolishing the rest—is routinely decried by preservation purists; at least the elegant neo-Georgian front survives despite the lamentable cost.